For some people, having body aches and pain after a hard workout is the sign of a job well done. It’s true that some muscle soreness can be expected after vigorous exercise, particularly if you haven’t worked out in a while, but aches that impede your progress – or make you less motivated to tackle a workout again – definitely aren’t welcome. Part of what goes in to dealing with body aches post-exercise is how you recover; there are correct ways to cool down after a hard workout, and they can help your body lose some of that soreness. Even better, a good recovery can go a long way towards keeping your muscles healthy and flexible, and more ready to snap back quickly next time. Most of us were taught at a young age that stretching before and after exercise is the key to good muscle recovery. However, it’s easy to forgo even a few simple stretches in favor of jumping right into the workout. Skipping stretching can particularly detrimental after you’re finished, since lactic acid builds up in your muscles as you move, causing soreness after you stop. That’s why it’s important to dedicate some time post-exercise to have a cooldown period, preferably involving light stretches that will help keep your body moving as your heart rate slows down. This Huffington Post article also recommends using a foam roller to massage out inflammation, and even getting a therapeutic massage can help. Hopefully you’ve been drinking lots of water as you exercise, and that shouldn’t stop just because you’re finished your workout. Dehydration can contribute to muscle soreness, and if you haven’t been hydrating adequately, you’ll be feeling the effects throughout your body. 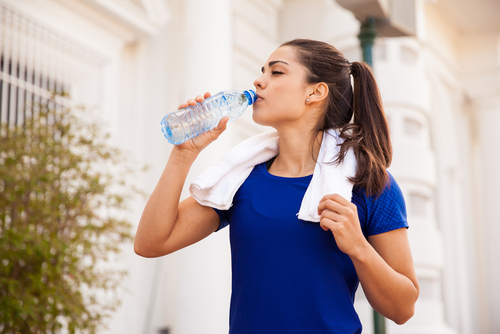 As you’re engaging in your post-workout cooldown period, be sure to pause for some water or even a sports drinks to help replenish the electrolytes your body lost through sweating. Keeping yourself hydrated is crucial not only to prevent soreness, but to prevent even more serious complications. What you eat post-workout is just as important as what you eat before your workout. If you’ve really gone hard on your workout, your muscles need nutrition to repair themselves – and if you choose to go without, you’ll be feeling the after-effects fairly quickly. You have about two hours after your workout to absorb food as fuel, and it’s critical that you get enough healthy carbohydrates to repair strained muscles and joints. Try mixing it with protein, such as brown rice with meat, or drink a shake with protein powder and fruit. If you really want to amp up your cooldown, add heat to it. You’re going to want to help blood flow back into your overworked muscles in order to get some relief from achiness, which means a hot shower, a dip in a hot tub, or even some time in a sauna is ideal. “Soak in a hot bath, or if the pain is isolated, apply heat directly to the spot that’s giving you trouble,” advises an article in Women’s Health, before also noting that peel-and-stick heat patches are currently on the market. You can even invest in a heating bag that only needs a few minutes in the microwave before being placed on your sore muscles for quick relief. If you’ve tried some or all of the above and your post-workout aches persist, it’s worth taking some pain medication to get some relief. Acetaminophen and ibuprofen are particularly good at easing the soreness, albeit temporarily, and they won’t do much about continued soreness the next day. Still, Popsugar suggests that if your aches are dire enough that you need some painkillers, you should consider taking two to three days off to let yourself recover. It’s definitely a sign that your body needs the rest. It can sometimes feel satisfying to have those muscle aches after you finish working out, but don’t take them as a badge of honor – how you help your body recover from a hard workout can determine how quickly you bounce back next time. It could also mean better injury prevention and more stamina next time you hit the gym. So whether it’s through proper nutrition, heat therapy, or even a massage, be sure not to ignore those nagging body aches. It could mean a stronger return to form the next time you lace up your running shoes. What’s your best method for getting relief from post-workout soreness? Let us know in the comments.